"Your challenge is not to keep trying to repair what was damaged; your practice instead is to reawaken what is already wise, strong, and whole within you, to cultivate the qualities of heart and spirit that are available to you in this very moment." If you have learned NVC and want to live it more fully in your life, imagine spending 5 glorious days totally immersed in NVC in a beautiful, serene location! 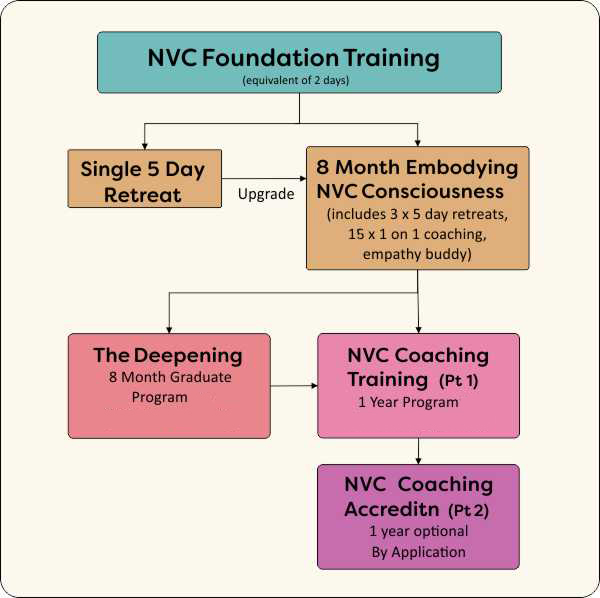 Every day you and your mini-community of NVC-ers will learn, share and practice together under the guidance of two Certified NVC Trainers, enhancing and integrating your NVC skills to every aspect of your life. Empathy buddy walks, inspiring conversation, quiet comfortable environment, yoga ... and NVC in action, 24/7 ... This moment-to-moment experience of 'embodying NVC' will show you how it is possible to live NVC on a daily basis. You will leave refreshed, reinvigorated and confident in your ability to use NVC in any situation. 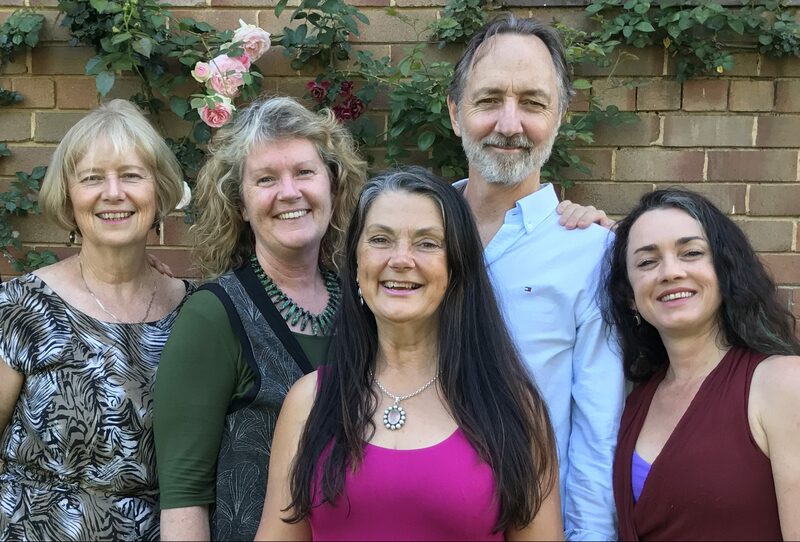 Along with the ongoing support of this NVC community through mentoring, forums, webinars and more, the Embodying NVC Consciousness experience will be one you will never forget. Each 5 Day Program is based on a specific topic, which together create the basis of all of our interactions. Each is a deep lived experience of Learning and Living from NVC Consciousness and each retreat reinforces each other... there is no set point to start. Each retreat can also be attended as a Single Retreat. The retreats include daily structured sessions where we are learning, practicing, and experiencing NVC skills and applying them to our everyday experiences. It is led by CNVC Certified Trainers. During the retreats we are together living from the awareness and skills of NVC by simply using NVC and this consciousness with each other and supporting each other to use the skills... both during sessions and when we are relaxing. So you are directly experiencing what it is to live from this place of non-judgment so you can take this back to your everyday lives. The team is available to work with you one-on-one in areas where you may require personalised support, making learning NVC easy. Every day you are nourished by spacious sessions where you go for Empathy Buddy walks, to practice giving and receiving empathy. Learning NVC is not meant to be serious! Yoga, massages, empathy buddy walks, and other activities all create not just deep learning but FUN! Some people know up front they want to attend the whole program. But if you are not yet sure, then you can easily and inexpensively upgrade from the single retreat... simply fill in the form at the end of the retreat! You can still do a Full 8 month Program with just 2 retreats (June/October 2019) or 1 retreat (October 2019) and all the other inclusions below. See the Investment page for full info. Fortnightly one-on-one phone or Skype sessions with an Embodying NVC Certified Coach, to support you in both the setting of your personal goal, and then working toward that goal together over the 8 months... using your real life situations in these calls whilst practicing and deepening your NVC skills. You will have an empathy buddy for the duration of the 8 months to regularly give and receive empathy with and to build your empathy skills. You can meet with the Embodying NVC community to share inspiration with, ask advice of, and reach out to for support 24/7. Access is limited to people who are graduates or part of the full program. There are a range webinars available as well as special invitations to advanced NVC programs. 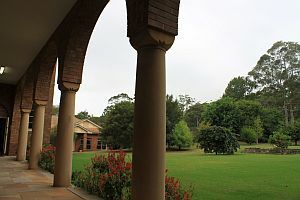 Located within the extensive grounds of Canisius College on the leafy North Shore, Peter Canisius House is 30 minutes from the CBD by public transport and 30 minutes by car from Sydney Airport. Steeped in history, the grand buildings are surrounded by beautiful gardens and reflective spaces. Below is a summary of our Core Programs.